This post is sponsored by Sunsweet. A few weeks ago, I was lucky enough to spend 24 hours in San Francisco with the team from Sunsweet! It was a really inspiring trip, and I learned a lot about their amazing company, the delicious products they create, the incredibly talented group I was so honored to be with, and my own inspirations and motivations in the culinary world. I was so excited when I was asked to be part of the 2018 Ambassador group for Sunsweet, because dried fruit is something we buy and use as a family on a weekly basis! 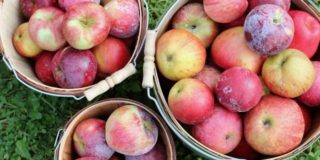 But I was also motivated to learn about the differences between all the different dried fruit options, especially when it comes to additives, health benefits, and best uses. After extensive tasting of all the different varieties of Sunsweet products (it’s a tough job, guys!) I was really pumped to come home and put them to use in our culinary creations at home. And while I might not be the regular gourmet chef that I once was, this time of year has me dusting off the apron and sifting through my favorite recipes as we prepare for the holidays and entertaining as a family. 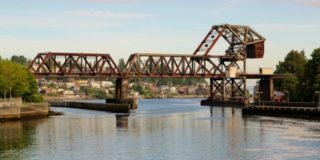 My mom and her husband are coming to Seattle for Christmas this year, and we are counting down the days until they arrive. Having a house full of family on Christmas Eve makes me want to cook a delicious and festive meal. I tested out some of my favorite holiday recipes last weekend, and wanted to share some of the swaps and substitutions I made with you guys for your own holiday menu planning! 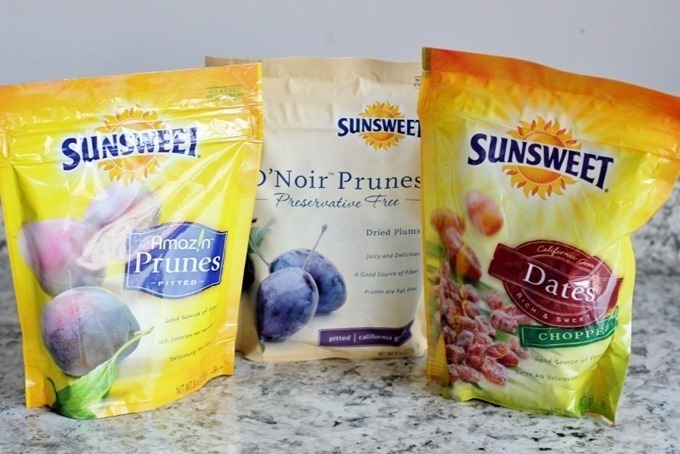 I know prunes aren’t known for being the most glamorous dried fruit, but I was honestly blown away when I learned about all their various health benefits. And in addition to helping with bone health and digestion, they are also sweet tasting, but with no added sugars. They can add moisture to entrees and baked goods, as well as help with texture for things like sauces and marinades. 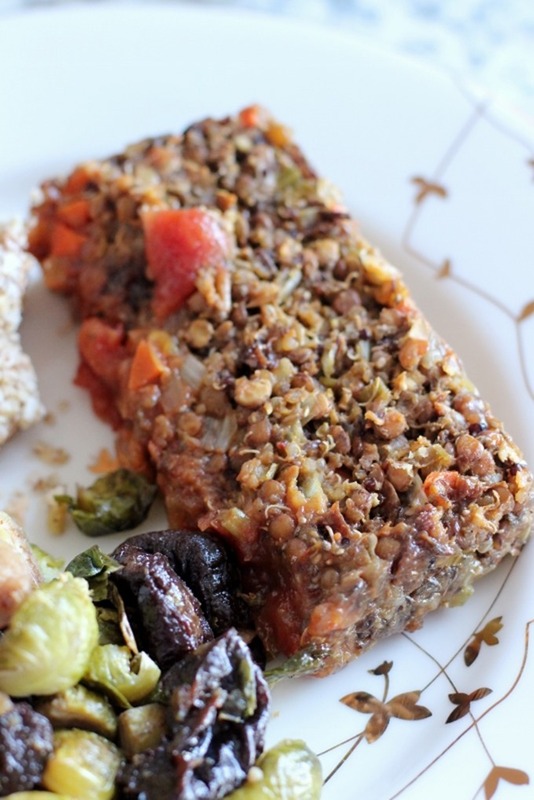 The first dish in my holiday lineup this year is my annual cranberry orange lentil quinoa loaf – the vegetarian main dish to so many of our Thanksgiving and Christmas dinners! But instead of the dried cranberries – which almost always have added sugars – I swapped in diced prunes for moisture, flavor, and to help bind the whole loaf together. Sunsweet actually makes Amaz!n Diced Prunes that don’t require any prep, but I opted to dice my own D’Noir prunes because I wanted them to be a bit stickier to help hold the final product together. 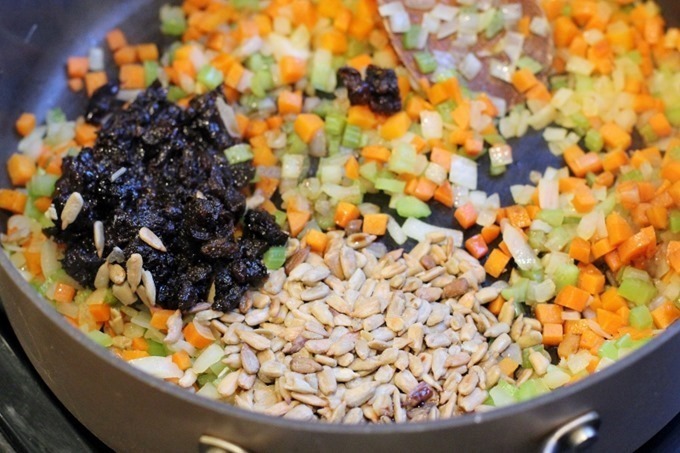 I swapped the same amount of prunes in (1/2 cup) and left the dried cranberries out, and I added them to all the other prep of veggies and seeds – my kitchen smelled AMAZING! The end result was honestly really surprising. I expected the dried fruit swap to make a big impact on flavor, but I couldn’t believe how much of a difference it made in the texture and binding! The prunes are so much more moist and sticky, and they really helped the whole loaf hold together into firm slices (unlike it’s usually crumbly mess). I have made this dish dozens of times and this is the best it has ever turned out. One swap we will certainly be sticking with in the coming holiday seasons! The next dish I made was one that came together in the aisle of the grocery store. I knew I wanted to do a roasted brussels sprouts dish, but I wasn’t sure exactly what else I wanted to add. In the back of my mind I was thinking of the brussels sprouts with fresh cranberries I made years ago, but knew I wanted to give it a fresh twist. The lightbulb went off when I saw a package of fresh chestnuts in the produce aisle – perfection! I trimmed and halved a sheet pan of brussels sprouts with a drizzle of olive oil and sea salt, along with the halved chestnuts. While the veggies roasted, I opened a package of the pitted prunes, and halved those as well (about 1 cup total) so that all the components of the dish would be consistently sized. Once the veggies were almost done roasting, I added the halved prunes and tossed it all to combine. I roasted for another ten minutes until it was all heated through and perfect for serving. Guys this dish was a HIT. 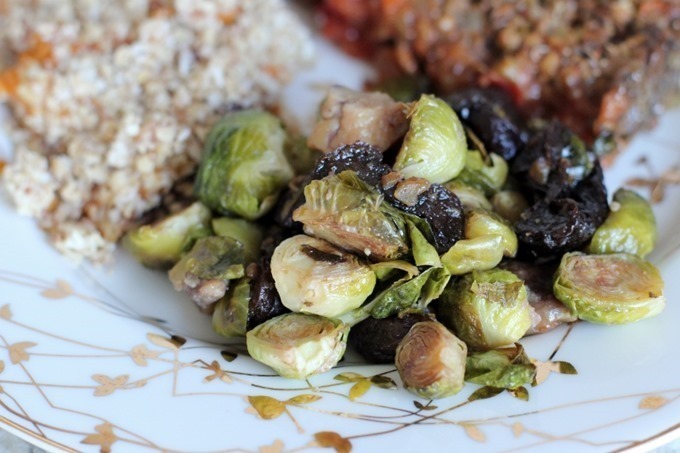 I couldn’t stop eating it, and despite the highly offensive brussels sprouts, even my kids loved it. I realize how over the top I sound right now, but I’ll seriously never make brussels sprouts again without prunes. They were the perfect complement – not too sweet, just the right plump texture, and the tiniest bit tangy. 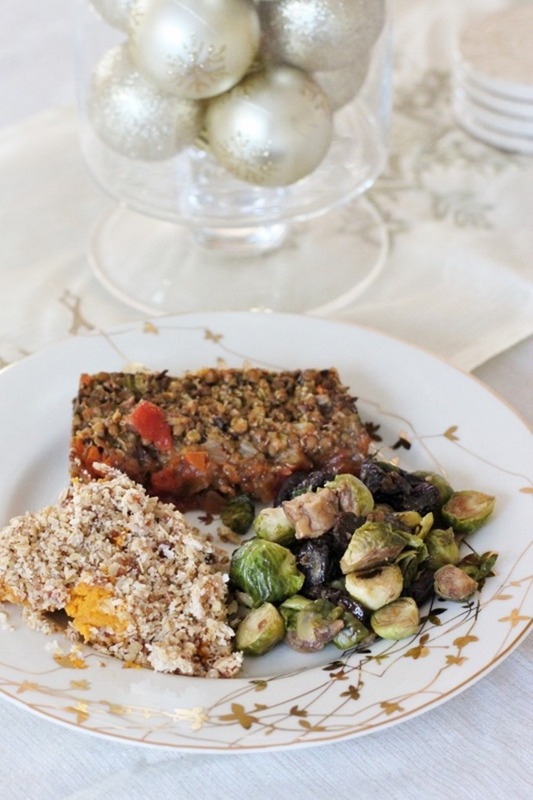 We will absolutely be adding this one to our Christmas dinner menu, and you should too! Unrelated, I can’t wait to bust out my favorite white and gold plates again for a festive meal. When we were getting married many years ago, I saw these dishes and fell in love with them. I didn’t want to register for fancy expensive china because it seemed so ridiculous, but I swooned over this gilded leaf china from Vera Wang that I noticed in Macy’s one day. But that’s not what this is – my place settings are seriously basic holiday dishes from TARGET of all places, and they are some of my favorite treasures. Eat your heart out, Vera Wang! Last but not least, we needed our third side – something filling, but sweet! 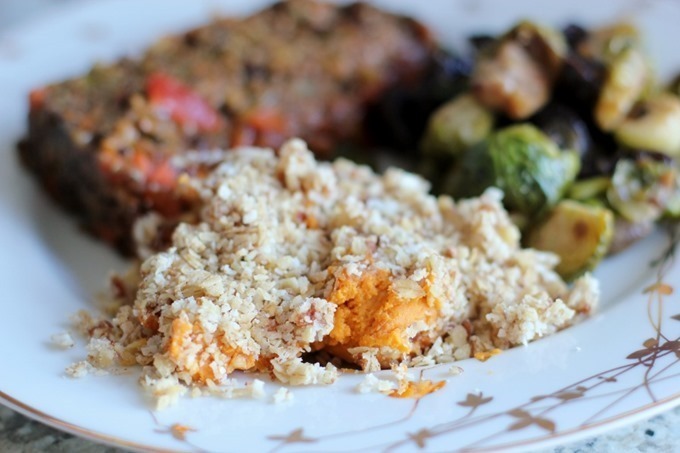 I made my favorite vegan coconut sweet potato casserole that we’ve been making for years and years now. But instead of the added sugar from maple syrup, I swapped in chopped dates for a delicious natural sweetness in the crumble topping. The original recipe called for 2 tablespoons maple syrup, so I omitted that and added in 2 tablespoons of the chopped dates as a direct substitution – the rest of the recipe I left exactly the same! Dates are often called “nature’s candy” and it’s hard to argue with that moniker. They are a naturally sweet compliment to everything from savory dishes to smoothies, and provide 3 grams of fiber per serving for only 120 calories. They are a delicious ingredient in baked goods as well as salads, dinner entrees and more. And because of their natural sweetness and sticky texture, dates work fabulously in desserts. They were a great addition to the crumble topping of rolled oats, coconut flakes, chopped walnuts and pecans, and winter spices – just the right sweetness with a bit if stickiness for binding. This dish tasted like dessert during dinner! We all shared a festive pre-holiday meal full of healthy and delicious swaps, and now I’m enjoying a refrigerator full of leftovers to eat during lunches this week. The gift that keeps on giving! I can’t wait to make these dishes again when our family comes in just a few short weeks (December is FLYING by!). Thanks to Sunsweet for the chance to try all their delicious products, and for an amazing trip to San Francisco! What’s on your holiday menu this year? 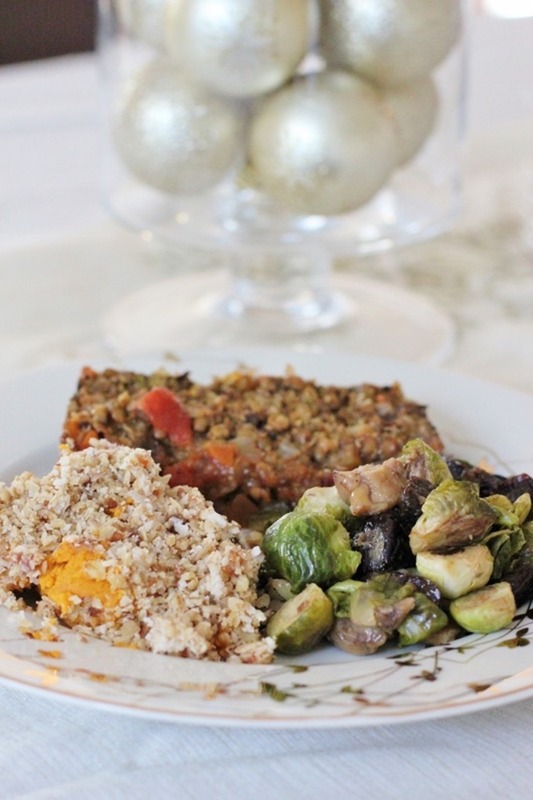 What are some of your favorite healthy holiday substitutions? 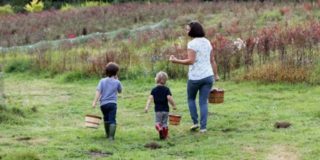 Next Post » Third Baby: Halfway There! Great ideas! 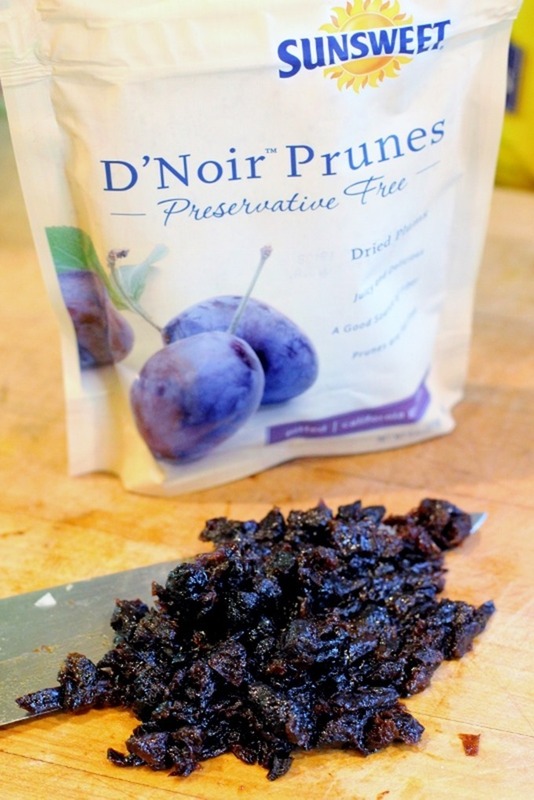 I have loved their D’Noir prunes lately but don’t even know what D’Noir means! Did they explain what it is? I’m glad that you’re back to posting more often but very disappointed that three of your last four posts were sponsored. Hi Eva! 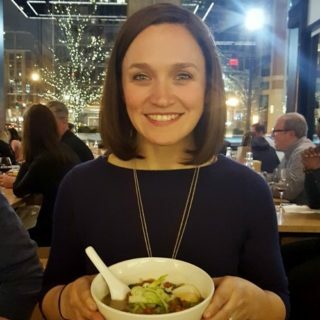 I’ve been enjoying Emily’s posts for years….absolutely FREE of charge! I’ve read posts I’ve agreed with and maybe a few I’ve disagreed with… but as long as I’m enjoying them for free who am I to judge? Just sayin…. Sarah, I also love reading Emily’s blog! It has provided me years of free enjoyment, recipes, advice, compassion, ideas, and entertainment. I feel grateful to be able to read great, well-crafted blogs like Emily’s for free. 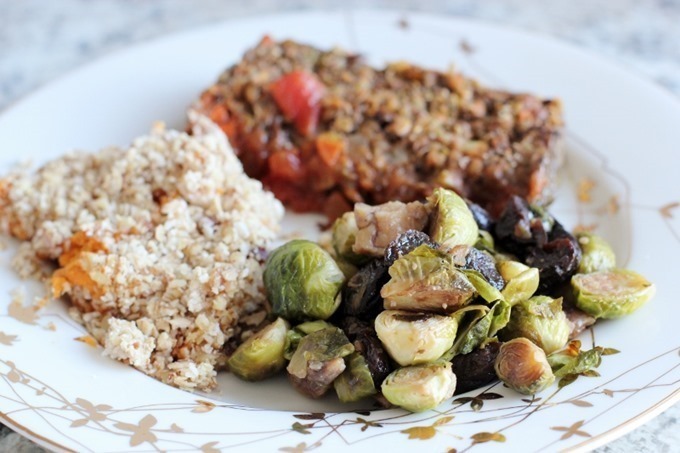 I’ve been wanting to try dates in a recipe for awhile but haven’t had the nerve – definitely trying this brussels recipe! Thanks Emily! Sarah, by no means was this meant to be disrespectful. Emily, I’ve been reading your blog since “The Front Burner” and the time you were training for a 1/2 marathon w Kath. I’ve missed your frequent blogging and was just disappointed with the sponsored topics. Miss YOUR posts. 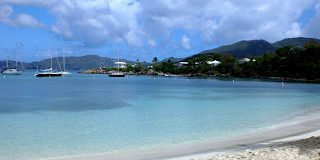 Anyhow- Wishing you a fabulous Christmas and enjoy your house full of family! Emily, I hope you and your family have a wonderful Christmas! 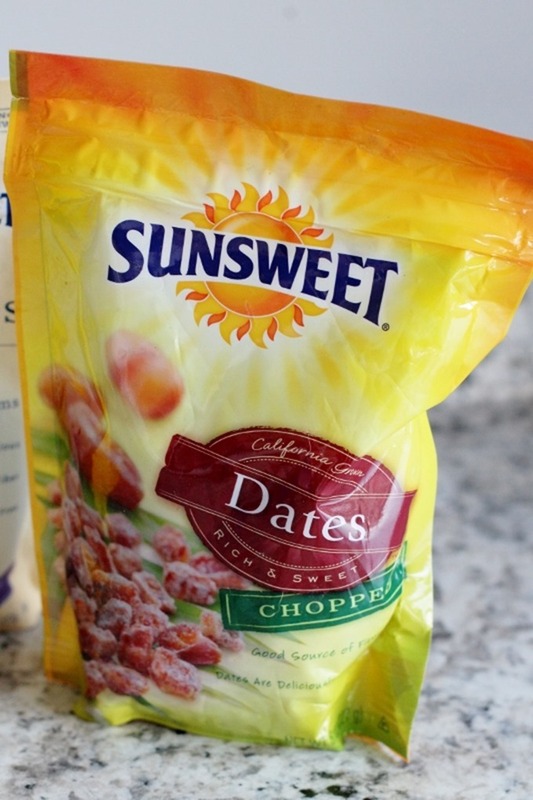 Thanks for the post reminding me that I can get creative with swaps and use dried fruit! 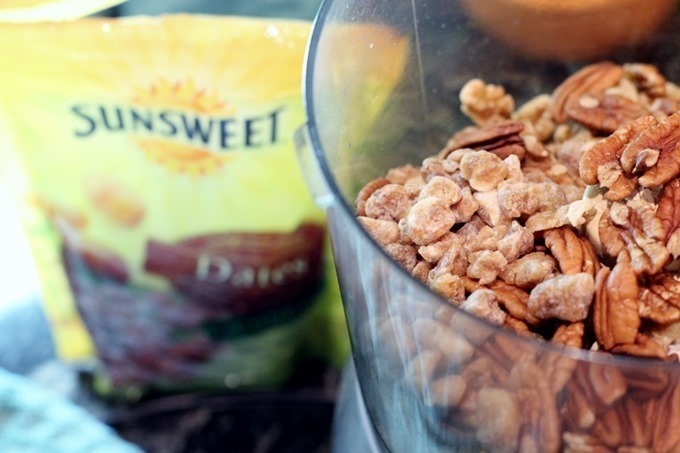 I love these fun ways of trying new dried fruits! 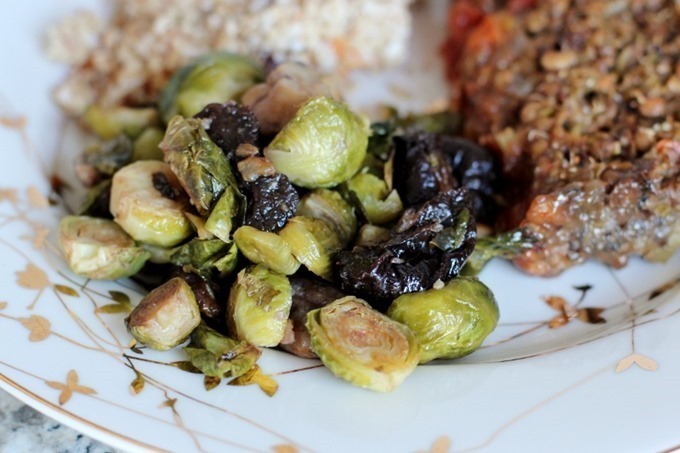 Brussel sprouts are my favorite so I can’t wait to try this recipe! 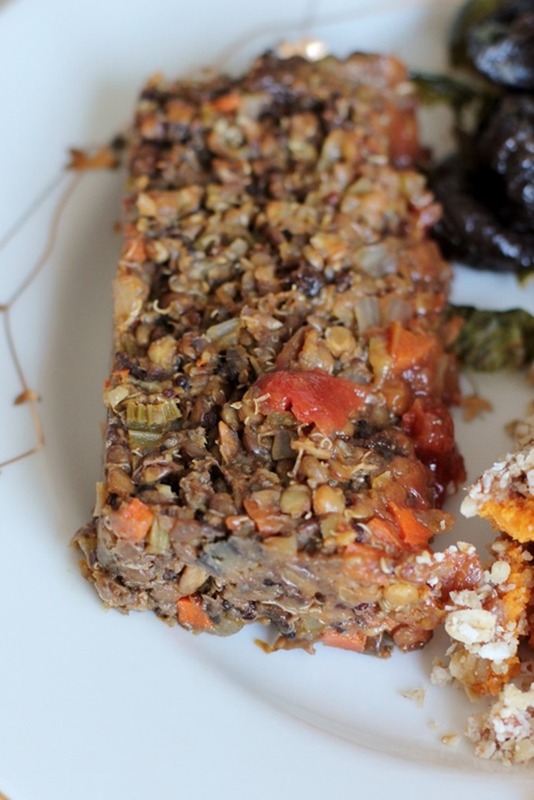 All of these dishes & their substitutions sound amazing! My husband & I LOVE prunes & dried fruit. Dates are indeed “nature’s candy”, & I need to cook with them more. I made almond-stuffed bacon-wrapped dates for Christmas. I’ll be trying these recipes out as well, thank you!